In college it was capes. Lots of capes. In middle age you get the parts with smoking jackets and double-breasted suits. The roles get rarer, but the clothes get better. Aging creeps up on you, like a critic you never noticed was in the audience until the review comes out. One minute you’re the 30 year old leading man for whom playwrights pen tons of parts, and the next you’re the character actor getting winded dancing the Charleston. You look around and the 30 year old guys on stage didn’t break a sweat. In between scenes, the 30 year old guys are doing push-ups in the wings to get up for the show. You’re not jealous, though, just kind of awed. You were never one to do push-ups without a P.E. teacher’s glare as the instigation. Doing theater involves remembering taboos and traditions, like not saying the word “Macbeth.” Supposedly, if you say it inside a theater bad luck will befall you or your cast. You are supposed to refer to it as “the Scottish play.” As if the Fates can’t figure out the ploy. As if bad luck is thwarted by verbiage. Side note—It would fun to work spotlight for “Macbeth,” and turn it off when the famous line comes. I am pretty sure I said the word backstage, and I definitely watched another guy straight-up say it without even remembering not to. Nothing bad happened. But these superstitions, passed on, put you in a kind of club whose membership runs back and back through time, to the first schmuck who said the play’s name and then, probably, fell into the orchestra pit which just happened to be outfitted for a show involving live crocodiles. I am only guessing. 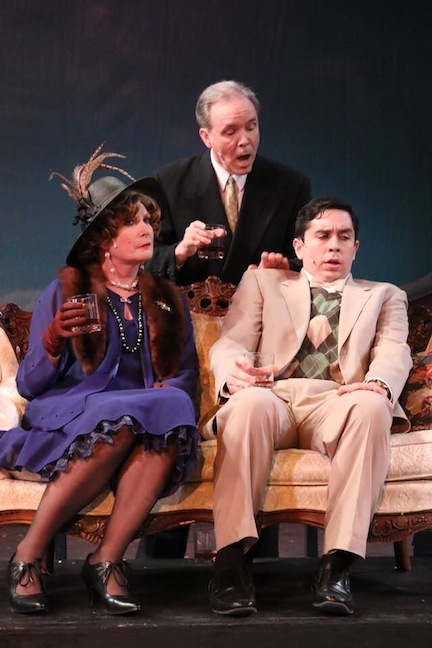 I got a couple of small laughs as Chester, which is the best part of doing a tragedy like “Gatsby,” in which the stage is strewn by the end (spoiler alert) with three dead bodies. Laughs in a drama are a little gift to help the audience cope. I have always felt that coping is overrated. I know I am in the minority. But let them cope if it means me getting a laugh. I only had one quick change. I had to exit stage left, toss an armload of clothes against the wall, rip off my fake mustache, glasses, vest and gloves and then hustle across the backstage while tying on an apron and donning a different vest, all in about a minute before entering stage right. It made my pulse pound. How many things do that these days outside of politics? When you go years without doing theater you can forget how magical it feels backstage where the lights are low, costumes are hung for quick-changes, there are prop guns and liquor bottles, fake ice cubes and cigarette lighters. The whole place smells like lumber, paint, makeup and hair spray. It’s that club thing again. We are back here, and they are out there, and what we are about to do to them they have no idea. It feels like having the password. It is, in essence, showing off. I know that. You dress up and show off. Normal people don’t need to. Actors and politicians and preachers; we’re all in the hey-look-at-me business. Society sanctions it, so we get away with it in the name of entertainment, diversion, governance, salvation. Call it whatever, I’ll take it. Now and then. I admit it is kind of weird to ask your wife to borrow her makeup remover, though. Goodbye to my loyal, funny readers...or is it?